Hannah Esper is a good friend of mine from our days working together in Chicago. She’s now a journalist and editor living in Michigan. She visited me in Chiang Mai in February this year, and we had a wonderful time seeing the sights and sampling the tastes of Thailand together. I asked her to write up something about her week there, and she obliged with this lovely piece on the things she learned about food in Thailand. Thanks, Hannah! Many people asked why I had chosen Thailand as my destination to meet Lisa on her trip. The decision was an easy one for me as I had worked as a server at a Thai restaurant when I was younger and had become accustomed to the food and culture. Thai food is still my favorite cuisine and I felt rather knowledgeable and excited about it going on this trip. 1. 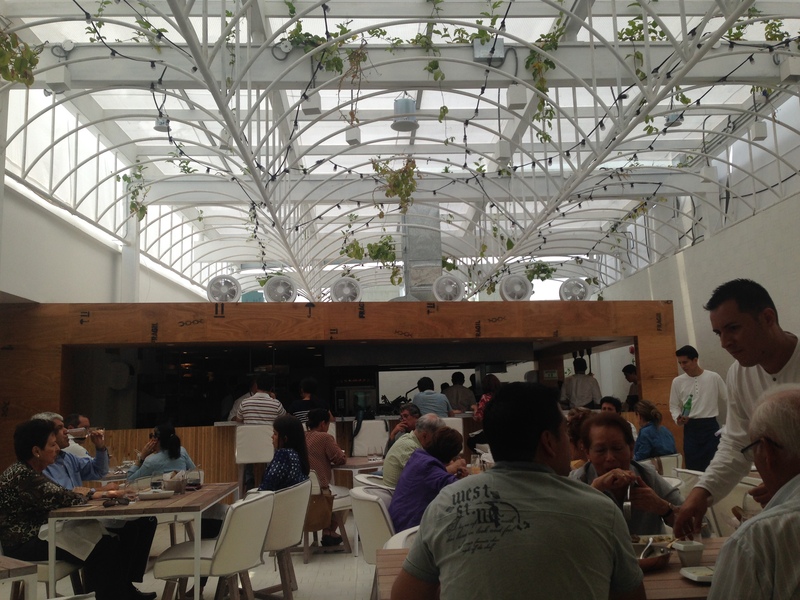 Atmosphere is not a good indicator for quality/taste. One of the best meals we ate was at this tiny place that was near our hotel. I wouldn’t quite call it a restaurant, as it was more like the back of someone’s house, as many places were. There were two tables in the alley that was basically a woman’s backyard. We were served on mismatched plates and silverware, and served our dishes one at a time, since there was literally one person cooking the food. It was pretty common in Chiang Mai, in fact, for dishes to come at all different times, which made eating with others interesting. The worst meal of the trip was at a cute, kitschy bar called “The Wall” that was owned by a Westerner. Adorned with Pink Floyd memorabilia, the bar served mostly Western food, including french fries without salt, and a terrible attempt at Pad Thai. 2. You often will not receive what you order, but it’s fine! 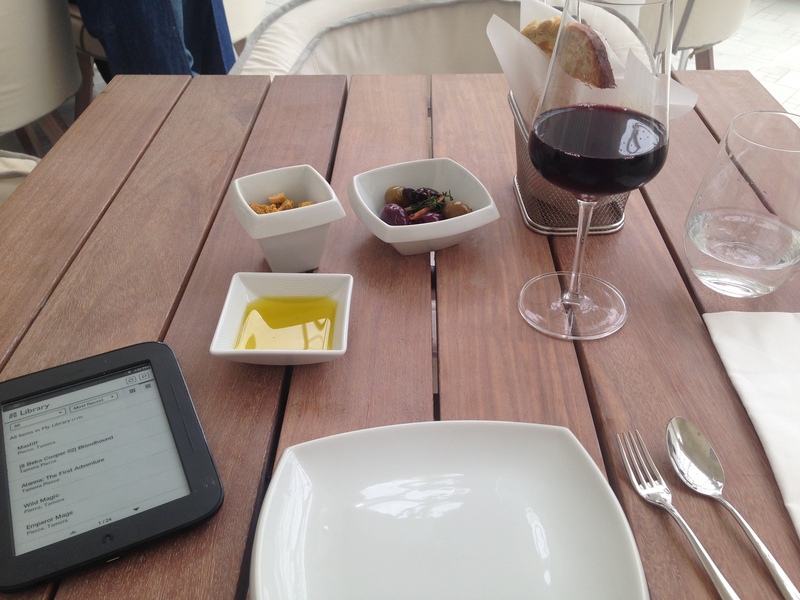 As was true at the backyard “restaurant,” mentioned above, you often don’t receive the exact dish that you ordered. The menu might say the chicken is fried, but it comes out grilled. Or the menu says the dish has broccoli in it but you actually get broccoli, carrots, and mushrooms. 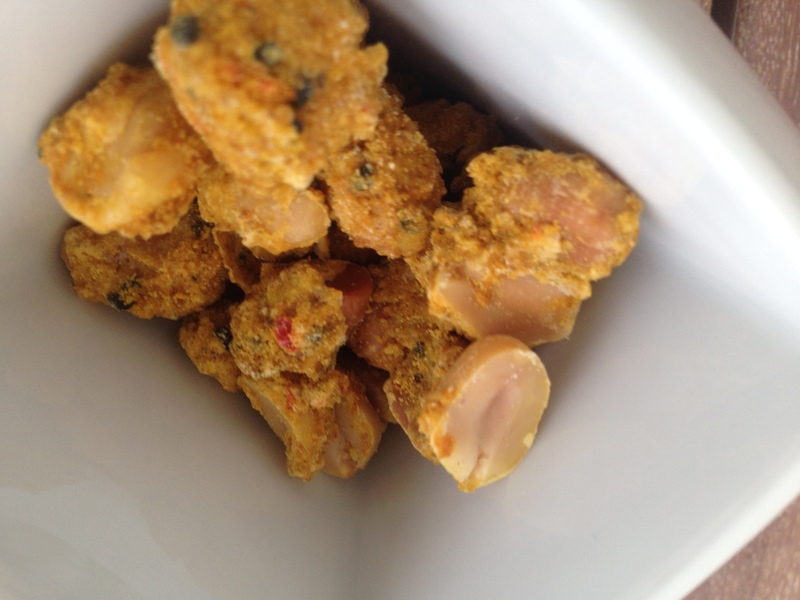 The most exciting surprise is… when you ask for mild spice and it comes out burn-your-insides spicy! The food was always delicious, though, so we didn’t mind these modifications. 3. 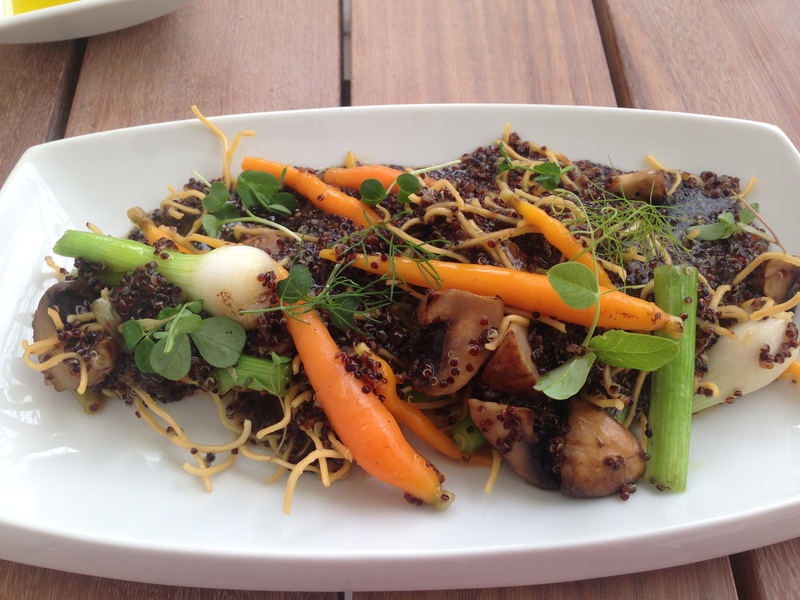 Vegetarian options are plentiful; you just have to look for them. 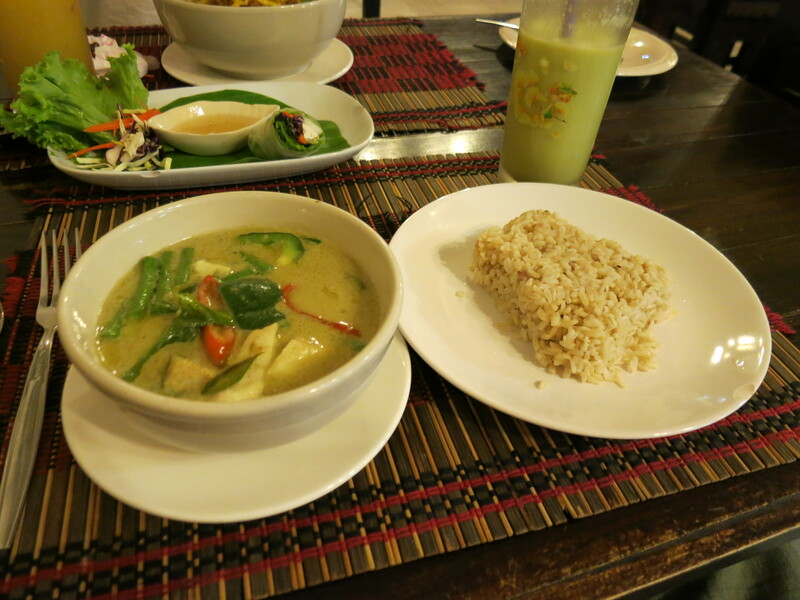 Thai food is great for both meat-eaters and vegetarians alike. The Thai restaurant I worked at in high school was a hot spot for all the vegetarians and vegans in town. In the states, tofu is a common protein option in most dishes at Thai restaurants. 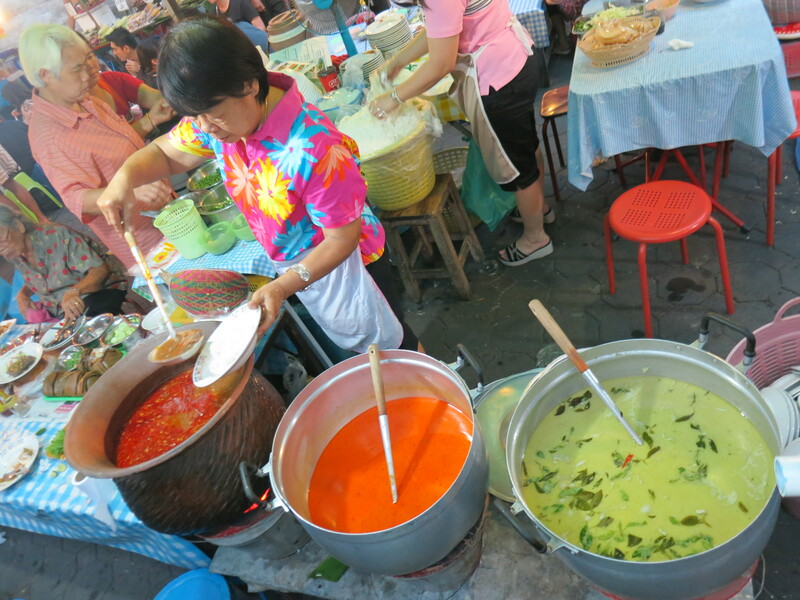 In Thailand, however, most food vendors serve dishes with the traditional protein that is intended for that particular dish. Tofu is often served in Pad Thai but not many other dishes. 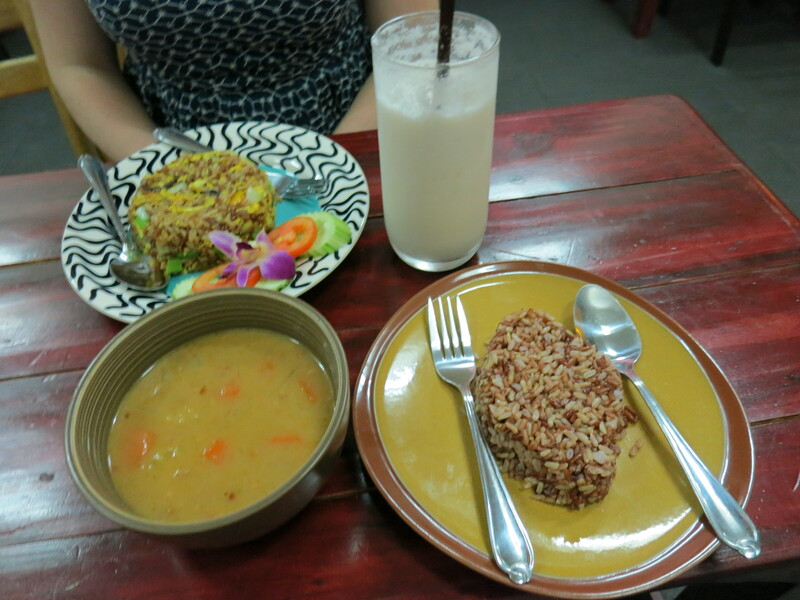 Fortunately, there were many restaurants in Chiang Mai that served strictly vegetarian food. After a couple days in town, Lisa and I got better at finding them. At these restaurants, traditional dishes were served with meat substitutes, but we found that most dishes were so flavorful that it wasn’t even necessary. We were content with just the rice/noodles, vegetables and curry. 4. Expensive does not equate to better. Probably the best food we ate in Chiang Mai was bought on the street, and cost less than $2. The first night I was in town, Lisa and I went to the Saturday night market, which had many vendors selling cheap eats on sticks. I did not partake in the meat-on-a-stick, but Lisa enjoyed it. I did, however, eat fried banana with condensed milk and it was quite possibly the best thing I’ve ever tasted. 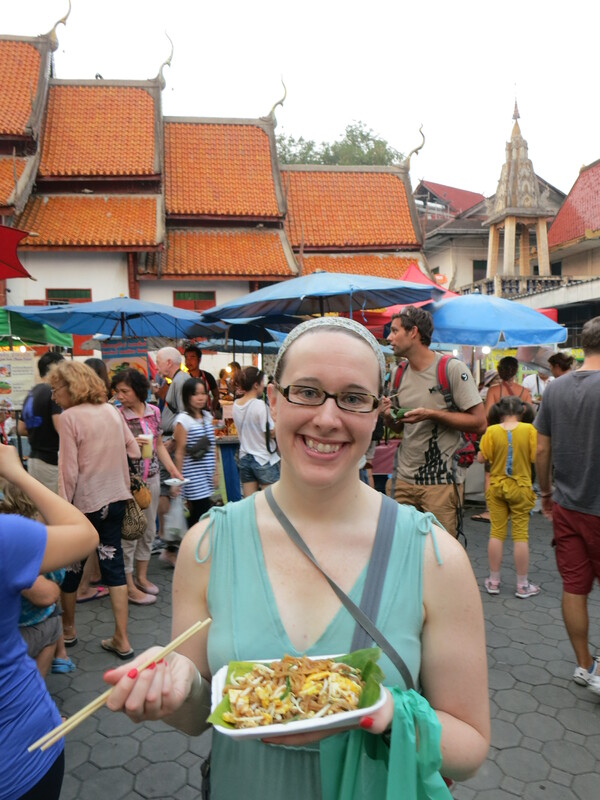 The Sunday night market had even better food and we enjoyed the best Pad Thai of the trip. The cook had a huge bowl of the pre-made ingredients, which she tossed in the wok with some fried egg and sauce and served up in a banana leaf. 5. 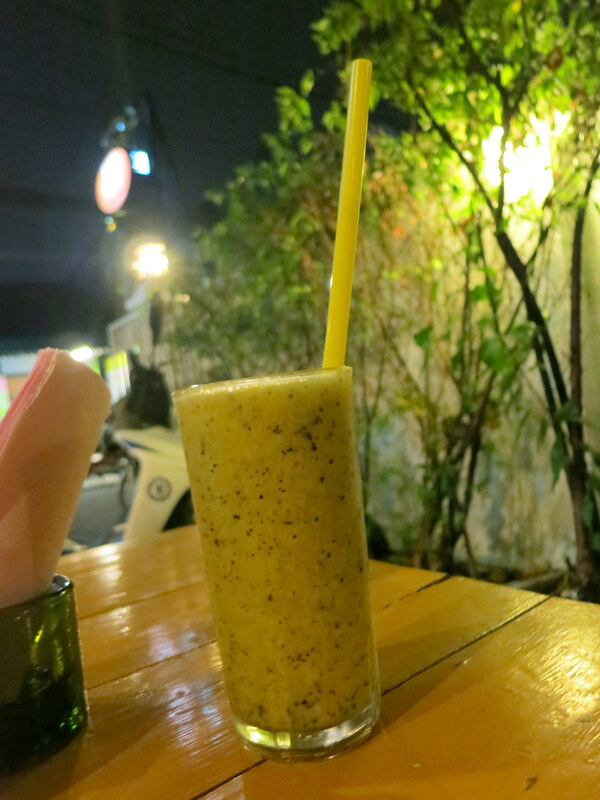 Fruit shakes – a surprising delight. On every corner. Every fruit combination. All delicious and cheap. Check out our favorites. 6. Nobody cooks Thai likes Thais. Since moving to Mississippi a few years ago, my mom has been going through Thai food withdrawal. We bought her a wok and she’s begun to cook her own Thai dishes. She’s even started teaching other Mississippians who’ve never had the pleasure of having good Thai, or any Thai, for that matter. 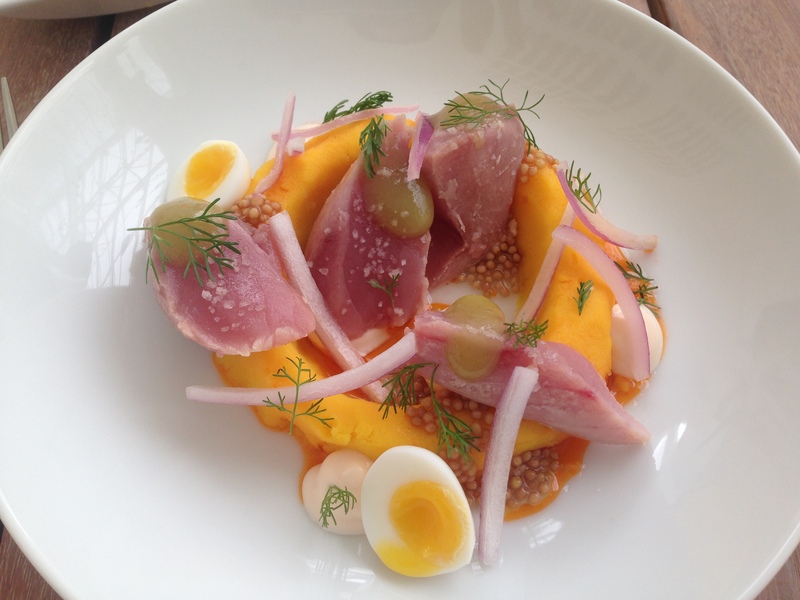 Her dishes are good… but it’s just not the same. Over the years, I’ve attempted to replicate dishes from my old restaurant. I picked up a few things while working there, but I just can’t get the tofu as crunchy or rice as sticky. During our trip, Lisa and I took an excellent cooking class at one of the local schools. 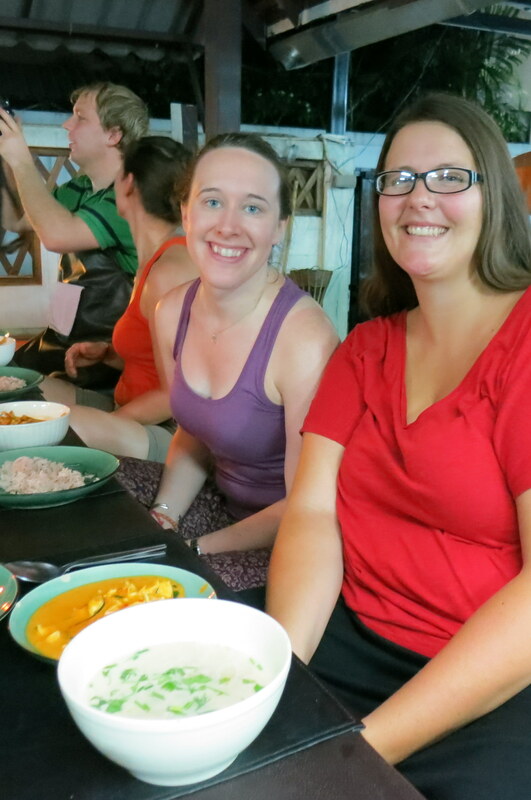 We learned to make a couple traditional dishes, including curry paste, and were sent home with a simple recipe book. Everything we made that night was incredible. Now that I’m home, I will try yet again to recapture the tastes of Chiang Mai. When you’re traveling more than a week or two, eating out for every meal is not only expensive but also a bit tedious. There’s something about a home-cooked meal, even when you’re not at home, that just tastes right. Of course, I usually prefer my home-cooked meals to be cooked by someone else, because I am lazy. But when I’m solo traveling, I don’t really have that option. So I try to make sure that there’s a kitchen wherever I’m staying. 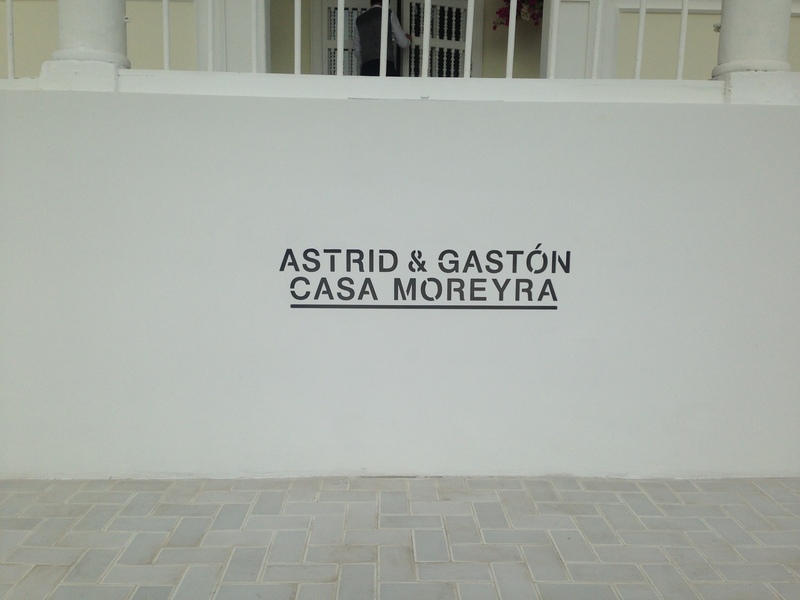 Not all hostels have kitchens, so you have to check the listing before booking. Once you’re there, check out the equipment provided (do they have sharp knives? more than one pan?) and see if there’s any communal food or spices before heading out to the store, so you don’t buy more than you need. Eva Holland provides a guide on hostel cooking, and Fiona Honor Hurley’s step-by-step list even includes recipes to try out in hostels. 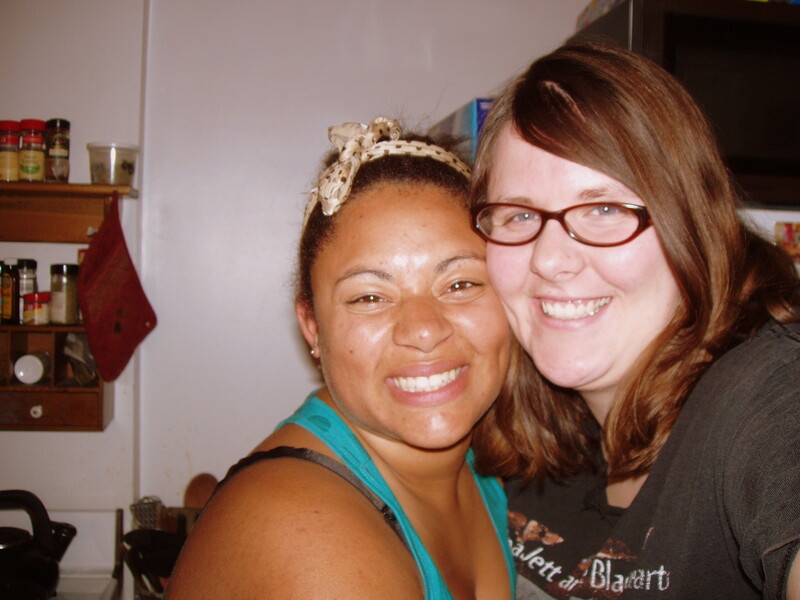 If you’re couchsurfing, many of the same principles apply, but since you’re in someone’s home, there are additional things to take into consideration. Are your hosts cooking at the same time; is there enough room in the kitchen for several meals to be made at once? Or even better, cooking a meal for your host is a great way to say thank you for their hospitality. Be sure to check for any dietary restrictions and kitchen rules before starting. For example, one of my former roommates was a vegan, and she had a special cutting board and knife that we meat eaters couldn’t use; good info to have before you start chopping up ingredients for a chicken stir-fry. There are fewer limitations when using a home rental service like Airbnb, since renting out the whole apartment means you have free rein of the kitchen provided. Still, surprises are possible; the twins and I checked the cupboards at our rental in Montreal and saw table salt. It was only when we returned from the grocery store and started cooking that we discovered the salt was a rock-hard block of indeterminate age. What tips do you have, dearest fellow travelers? I love fruit. I do not love vegetables. Their texture is all wrong, it’s difficult to cook them just right so they’re not too hard or too limpid, and they taste far too much like earth and not nearly enough like something delicious. But being a grown woman of 28, I am aware that I need to eat more vegetables. I’m training myself to eat broccoli since it’s basically the best vegetable for you. How do I do this? 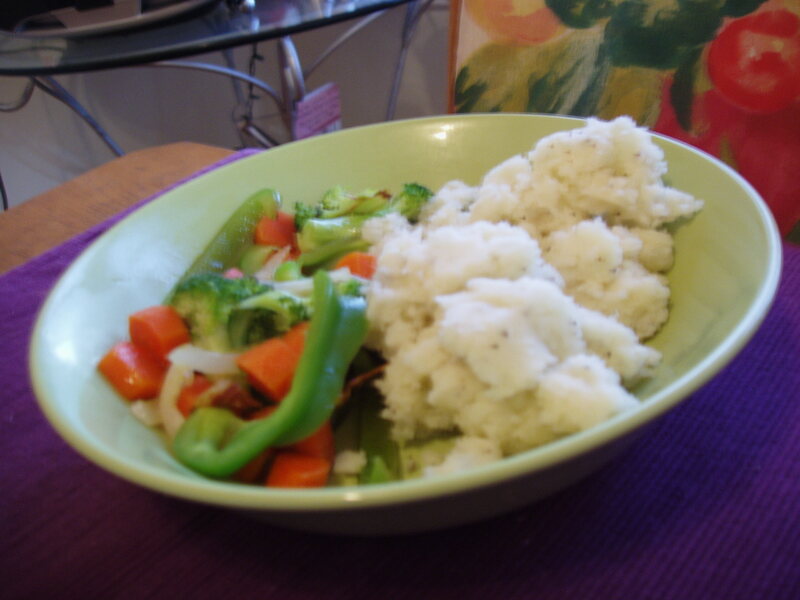 Mix the vegetables I do like in with broccoli, and stick them all next to mashed potatoes. Conceal and deceive! For the record: it was not a fully successful experiment. Broccoli is still a tiny tree trying to sprout in my mouth. Perhaps repeated attempts will yield better results. If not, there’s always the mashed potatoes.